In this issue of Wonder Woman, Steve Trevor kicks a griffin in the face then gets head-butted by a satyr. So yeah, this run has been pretty dang fantastic so far. Also, that griffin is the best. She calls Steve a “beakless idiot,” which is a sick burn coming from a griffin. Then she talks about how she doesn’t trust human males at all and only trusts “egg layers.” And sure, fair point, awesome griffin. Plus she’s a key member of some sort of renegade group of mythological creatures. There’s the aforementioned satyr, a minotaur, a dryad, and more. It’s a cool crew. I’m all about whatever these creatures are up to. I am about to discuss the events in this very fine comic book! Look away if you haven’t read it yet! And go pick it up if you haven’t! It’s super good! G. Willow Wilson isn’t screwing around here, gang. She didn’t take over Wonder Woman just for a lark. She’s not that kind of a writer at all. If you’ve read Ms. Marvel (and if you haven’t, what are you even doing?! Go get on it! It’s phenomenal! ), you know that Wilson has a knack for tackling big, complicated ideas through fun superhero adventures. Ms. Marvel is rip roaring fun, to be sure, but there’s always a lot of thoughtful, relevant themes at play. And now Wilson is bringing a similar approach to Wonder Woman. 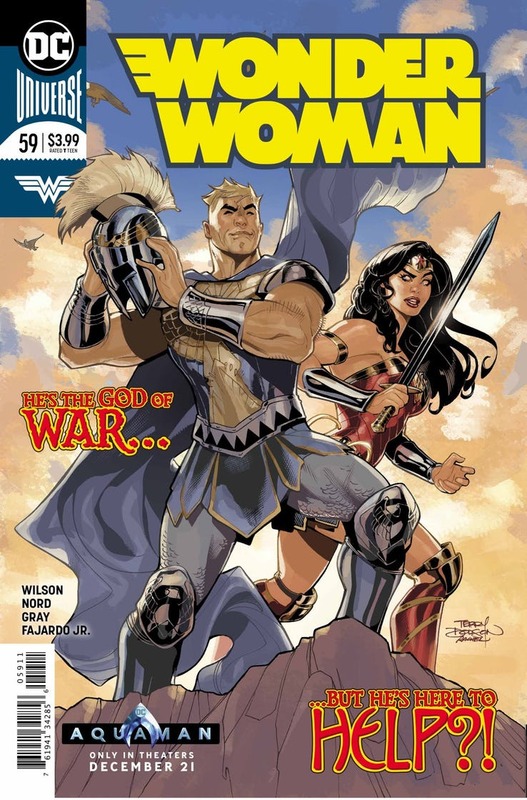 Ares is back on Earth, and he’s styled himself as a hero, drawing inspiration from Wonder Woman herself. He’s defending an oppressed ethnic minority group in Durovnia from violent government forces, which is a noble stance. Definitely something Wonder Woman would do. Except that when they spot a Durovnian missile headed for them, instead of redirecting it into an empty field, Ares sends it to a home of Durovian government supporters, killing them all. Wonder Woman is furious, of course, but Ares is perplexed. Doesn’t she carry a sword? Hasn’t she killed her enemies? Then the tables turn even more. American fighter jets streak overhead, allied with the Durovnian forces. Ares wants to destroy them, but Wonder Woman saves them. Now it’s Ares who feels angry and betrayed. Those fighter jets were targeting the oppressed people he was defending. In not stopping them, Wonder Woman essentially sided against him and his cause. Wonder Woman vs. Ares should be the most black and white confrontation ever. A warrior for peace against the god of war and destruction. The right and wrong of it all should be clear as day. Except that now, it’s not. Modern warfare isn’t that simple. So much of it is shades of grey, and now Wonder Woman and Ares find themselves mired in this grey. As much as Wonder Woman is outraged at Ares’ actions, there’s an argument to be made that they are more the same than they are different. They’re not exactly the same, of course. Wonder Woman wouldn’t kill civilians, no matter who they supported. But she works with the Americans, who support the Durovnian military. She uses weapons of war against her foes. Her hands are not entirely clean. Ares still sees things in black and white, but from the side of the oppressed now. Instead of glorying in military might above all else, he takes a moral stance and glories in turning that might against the tyrants who wield it. And yeah, tyrants are bad, right? Ares is doing some sketchy stuff, but he’s not entirely wrong here. Is he going too far, or is he just being realistic? I’m still on Wonder Woman’s side, because of course. She’s Wonder Woman. And killing civilians is a step too far for me. But dang if this book isn’t raising some fascinating questions about war and where we decide to draw the line when it comes to defending what we believe in. There’s not a simple answer here either, and I’m excited to see how this arc continues to dig into it all. From her earliest days, Wonder Woman has been associated with war. She left Paradise Island in 1941 to go fight the Nazis, after all! But war has gotten far more complicated over the decades, and I’m glad to see the book diving into the messy complexities of it all. Plus, there’s a cool griffin! The series is digging into heavy stuff with Wonder Woman and Ares, so the comic relief and intriguing mysteries of these mythological creatures is a welcome contrast. I’m intrigued by the cliffhanger, which suggests that the leader of the beasts is a woman of some sort. Perhaps a goddess? It looks like Olympus might be back, if in a rather damaged state. And if there’s a goddess in charge, is this divine return connected to Ares’ recent escape? There’s a lot of cool stuff at play here. While the writing is great, I did find the art a bit hit and miss in this issue. Some of the pages are really nice; Cary Nord and Mick Gray are talented dudes, and they can do exciting action. But some of the pages feel super rushed. There’s a lack of detail in certain panels, with proportions that are off and simplistic linework that looks like it was hastily cobbled together. And honestly, that’s just how it goes these days with bi-monthly books. It’s hard to keep up a high level of quality at that pace. We’ve seen it several times before. Still, there are some rough moments in this issue. Writing this good deserves good, consistent art, and I hope that editorial can figure out a way to keep everyone on track and putting out quality work. But this is a stellar issue nonetheless. The story is dealing with some big ideas in intriguing ways, plus it brings a huge dose of superhero spectacle and fun with each outing. I can’t wait to see where this story goes. This entry was posted on November 28, 2018 at 2:56 pm and is filed under WW Comics. You can follow any responses to this entry through the RSS 2.0 feed. You can leave a response, or trackback from your own site.